Guidry's Seafood Stew 3.25 oz. 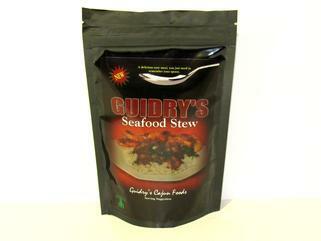 Home » Products » Cajun Dinner Mixes » Soup & Gravy Mixes » Guidry's Seafood Stew 3.25 oz. Guidry's Cajun Seafood Stew Mix is an authentic Cajun stew. Add crawfish or shrimp to the mix and cook. This product is made with a fat-free roux and the freshest products.